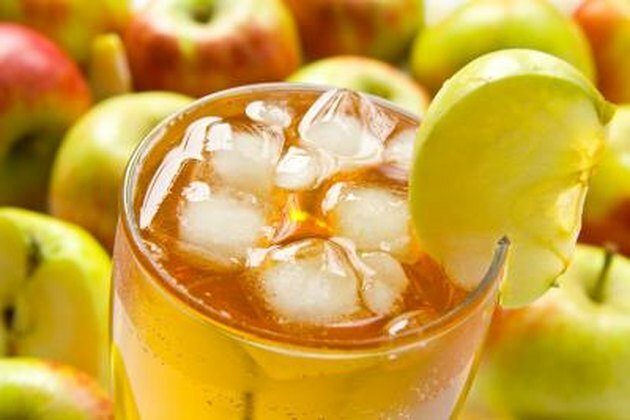 Apple juice is a healthy beverage option for many people, serving up small amounts of a variety of vitamins and minerals. However, you may experience a range of side effects from drinking apple juice, including gastrointestinal problems. Carefully evaluate whether apple juice is an appropriate beverage for your meal plan. Drinking too much apple juice may trigger diarrhea. Apples and apple juice contain sorbitol, a naturally occurring but undigestible sugar. Some artificially sweetened apple juice may contain chemical sorbitol as well. A study on rats published in the December 2006 issue of the "World Journal of Gastroenterology" reveals that diarrhea triggered by sorbitol is the result of the intestine's inability to absorb this compound. Even drinking small amounts of apple juice may cause diarrhea if you have a sensitivity to sorbitol. Speak to your physician if you suspect you may react easily to sorbitol in apple juice. Apple juice does not contain a great deal of fiber. A 1-cup serving of this sweet beverage provides only 0.5 g of this nutrient. Combine this with the sugar content of artificially sweetened apple juice varieties, and you may experience constipation if you drink a great deal of apple juice. Foods high in sugar may trigger constipation, according to nutrition writer Nancy Appleton, Ph.D., and fiber helps decrease your risk of constipation. Eating an apple instead of drinking apple juice will help you introduce more fiber into your diet, and opting for unsweetened apple juice may also reduce your chances of developing this bowel problem. As with diarrhea, drinking sorbitol-rich apple juice may trigger gas, which can take the form of flatulence, belching or abdominal bloating. While generally not a dangerous problem, this side effect of drinking apple juice can be embarrassing and annoying. If you react to sorbitol, drinking this juice may not be a good option for you. However, speak to your physician about options for treating sorbitol-related gas if you are unwilling to give up apple juice. Do not drink apple juice if you have a tendency to develop kidney stones because this juice contains oxalates, which may trigger the formation of calcium oxalate stones. Evidence published in the February 1996 edition of the "American Journal of Epidemiology" indicates that study participants who consume 240 mL of apple juice each day demonstrated a 35 percent increase in kidney stone formation risk. Consult your nutritionist or health care provider to discuss apple juice consumption and their relation to kidney stones. Rheumatic.com; 146 Reasons Why Sugar Is Ruining Your Health; Nancy Appleton, Ph.D. The American College of Gastroenterology; Belching, Bloating and Flatulence; L. Szarka, M.D., et al. Does Apple Juice Relieve Constipation? Is Pear Juice Good for Constipation?